Last April, Jason Kubel was probably extremely interested in locating the reset button. After all, through the season’s first month Kubel was hitting an anemic .219/.352/.329 (BA/OBP/SLG). At that time, opponents relegated themselves to throwing a vast majority of junk and off-speed pitches up at the Twins DH the season’s initial month. This came on the heels of him lacerating fastballs all over the Metrodome so it’s no small surprise that team adjusted. (1) He has opened his stance up and (2) lowered his bat angle before his swing. 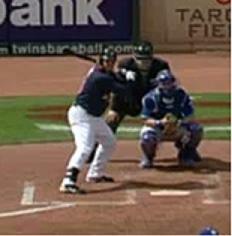 Addressing the latter first, in Kubel’s 2010 swing, the first movement his bat made was downward once the pitch was on the way but then it popped right up again. 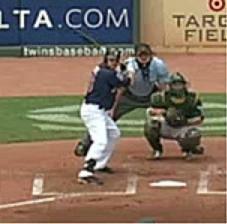 On the other hand, his 2011 swing quiets that but simply popping up and then driving towards the ball. But, as you can see in a side-by-side comparison of last year, what stands out the most is that Kubel has opened up his stance...again. When the Twins drafted Kubel out of his Palmdale, California high school in 2000, he had an opened stance with considerable pre-swing bat movement. Back in 2004, the year he had his first taste of big league play, prior to being hindered by various leg maladies which stunted his development, the powers-that-be attempted to dissuade him from using the opened stance. That year, Jim Dwyer, the team’s minor league hitting instructor, had him close his stance. It’s hard to argue Dwyer’s teachings considering the results Kubel posted. In that year, in 150 games split between New Britain, Rochester and a September call-up in Minnesota he hit .347 with 24 home runs. By closing his stance and getting him to quiet his pre-swing bat movement, the Twins helped Kubel become one of the game’s best potential offensive threats – leading Baseball America to rank him as the number 17 overall minor league prospect. For a spell, this did just fine for him. From 2006 to 2009, he hit .277/.339/.476 and become a powerful middle-of-the-order presence for Ron Gardenhire’s team. But perhaps the fallout of having such a rough introduction into the 2010 season coupled with the new home field’s overwhelming need to pull the ball coerced Kubel and hitting coach Joe Vavra into re-examining his approach at the plate. After all, the opened stance allows a hitter to see the ball more, hopefully identifying the spin of the off-speed pitching quicker and more readily – a practice that seemed to evade him last year. This approach also has a recent history of helping other lefties too. When the Yankees’ hitting coach Kevin Long went to revamp the left-handed hitting Curtis Granderson’s approach during the playoffs last year, Long opened up Granderson’s stance to help him see the ball better. Clearly, Granderson has continued to rake since this adjustment as he is currently just ahead of Kubel in the well-hit average category so far this year. It goes without saying that as Joe Mauer. Justin Morneau and Delmon Young remain sidelined with various ailments, if the Twins expect to gain ground against the surprising leader of the AL Central this weekend, the team need individuals like Jason Kubel to step up and maintain this pace until reinforcements arrive. Given his new approach and the early returns it has brought, watch for him to be a big factor in the upcoming series against the Indians who have three right-handers on the mound. REALLY nice focused work. You make it fun to follow the Twins from Ho Chi Minh City. Beautiful, nice to see Kubel get some down-home analysis as he has really been the savior of the decimated Twins lineup this year. Great article per usual. Only complaint is the usage of "early dividends." The overusage of the term "paying dividends" is annoying enough and "early dividends" is a complete oxymoron. One more detail for you to consider: If you draw an arrow in the direction Kubel transfers his weight, you'll notice a difference in direction. This year, his weight transfer is more pronounced, and it's back at the pitcher. I think that is a fairly accurate assessment: he's definitely not pulling off the pitch as much as he did last year. Another point that FSN has brought up from time to time that should be highlighted is that if you look at the aggregate of video clips, he's definitely making contact with the ball out-front more in '10. By allowing the ball to get deeper, he gets more leverage out of his swing and thus driving the ball better.